Marine Diesel Engines Market size was over USD 5 billion in 2016 and is set to grow over 5% by 2024. Growing seaborne trade coupled with positive outlook toward shipping industry will drive the marine diesel engines market size. According to a UNCTAD report in 2015, seaborne trade grew over 4% between 2012 to 2014, supported largely by substantial increase in dry bulk trade owing to rapid economic development in China. Significant growth in container trade accounted for over 23% of the world-wide seaborne trade in the period. More than 80% of trade is seaborne, however it is also a major contributor to carbon emissions. In 2007, international shipping accounted for more than 82% of global carbon dioxide emissions by the shipping industry. Rising demand for economically viable engines coupled with growing maritime tourism will further stimulate the marine diesel engines industry share. High reliability and alternately used for auxiliary power generation may further boost the product adoption. These systems operate at an average efficiency of 40% to 50% depending on the deadweight tonnage, vessel size and engine age. Cost affordability coupled with optimum utilisation of fuel will positively impact the marine diesel engines market. Diesel is the most widely available fuel in the world. Additionally, the current price levels are favourable for ship operators, as fuel costs are a substantial overhead which directly impact the trade profitability. However, growing concerns towards reduction of emissions coupled with growing emission control areas may act as industry restraint. Medium speed marine diesel engines market is set to exceed USD 3 billion by 2024. Rising demand for commercial vessels, cruise and ferries including passenger, cargo and fast ferries will further complement the business landscape. In 2016, MAN Diesel & Turbo signed a contract with P&O Cruises and Costa Asia to supply medium speed engines for their three new cruise vessels. Low speed marine diesel engines market is projected to witness growth over 4% by 2024. Increasing ship bound trade with rise in manufacturing of merchant vessels including tankers, container vessels and cargo ships will further stimulate the product demand. High speed engines are widely used in naval, coast guards and fishing ships that operate on various range of speed. Cruise and ferry in 2016 accounted for over 20% of the global marine diesel engines market share. Rise in disposable income coupled with improvement in standard of living will stimulate the product demand. As per Florida-Caribbean Cruise Association (FCCA), there were 23 billion passengers globally that cruised in 2015 when compared to 22 billion in 2014. Increase in government spending towards deployment of navy ships subject to strengthening of security will drive the market. In 2014, the U.S. Navy had 288 naval ships which, increased to 308 by 2015. China has ambitious plan to expand its navy strength by introducing submarines, aircraft carriers, nuclear missiles carriers which may positively impact the industry size. 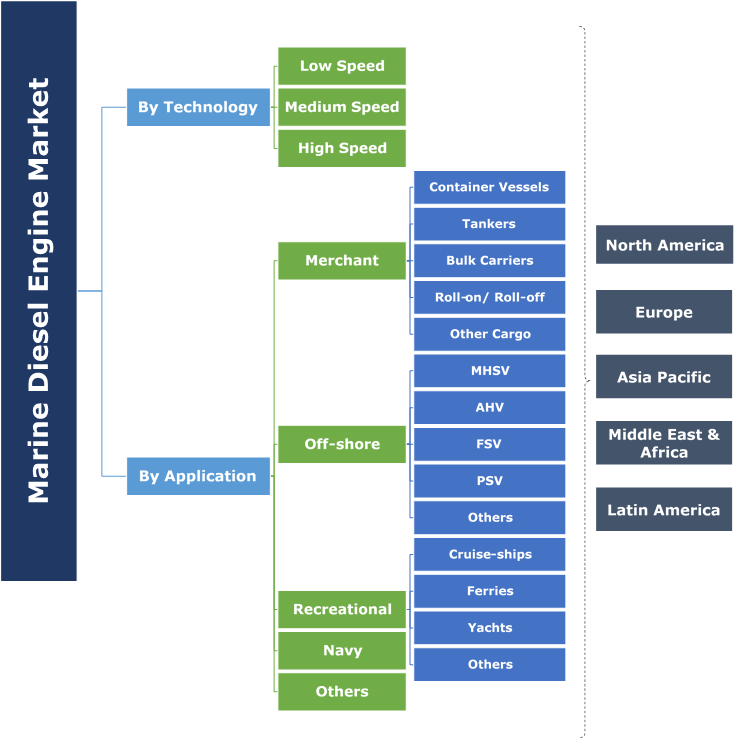 Merchant vessels marine diesel engine market is set to witness growth of over 5% by 2024. Growing demand for tanker & container vessels, bulk and gas carriers coupled with increase in seaborne trade of LNG and other products across the globe will augment the business landscape. According to Shell, LNG demand was 265 MTPA in 2016 when compared to 250 MTPA in 2015. U.S. marine diesel engines market share is predicted to witness gain over 4% owing to increasing investments toward shipbuilding across the region. Positive outlook toward shale exploration and production coupled with ongoing research and development to manufacture engines adhering to the new environmental norms will positively influence the business growth. China in 2016 accounted for over 25% of Asia Pacific marine diesel engines market share. Flourishing sea transport network coupled with presence of large shipbuilding companies will fuel the industry growth. Affordable labour cost and abundant availability of raw material are some of the key parameters which may enhance and boost the product penetration. In 2015, MAN Diesel & Turbo signed a ten-year agreement with CISC and CSSC to manufacture low speed diesel engines in China. Additionally, China is also increasing its import of products. In 2015, China imported marine diesel engines worth USD 1.05 billion. Increasing governmental investment to strengthen its shipbuilding sector coupled with growing skilled workforce will propel the South Korea market. In 2016, Government of South Korea invested USD 9.6 billion to enhance its shipbuilding business. Germany in 2016 accounted for over 20% of Europe marine diesel engine market share. Increasing government spending on military ships coupled with rising demand of specialized ships will complement the business outlook. Notable players in the marine diesel engines market include A.P. Møller-Maersk, Wartsila, Man D&T, NYK Line, Mitsui OSK Lines, COSCO, MSC Mediterranean Shipping, Anangel Shipping, Kawasaki Kisen Kaisha, China Shipping, Teekay, Carnival, China Merchants CMA CGM Holding, BW Group, Euronav NV, Sinokor Merchant and China Shipping Development. Global manufacturers are now focusing on technology advancement and innovations to develop fuel efficient and cleaner engines. 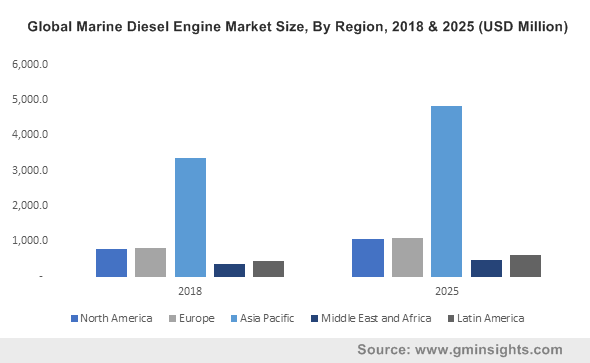 Innovations related to development of engines that are powered by renewable energy such as solar & wind and LNG fueled engines will also propel the marine diesel engine market. These systems are used to generate power for the marine vessels in the sea. Technological advancement in the product including hybrid turbochargers will help in reducing operating cost and fuel consumption. Easy availability of fuel and wide acceptance of these products by ship manufacturers will complement the business landscape. Companies are developing their distribution network globally to meet the increasing demand from across the globe. These products are widely used in merchant, offshore, navy cruise and ferries.